Published May 2, 2017 at 477 × 600 in New Church Art Dedicated!. 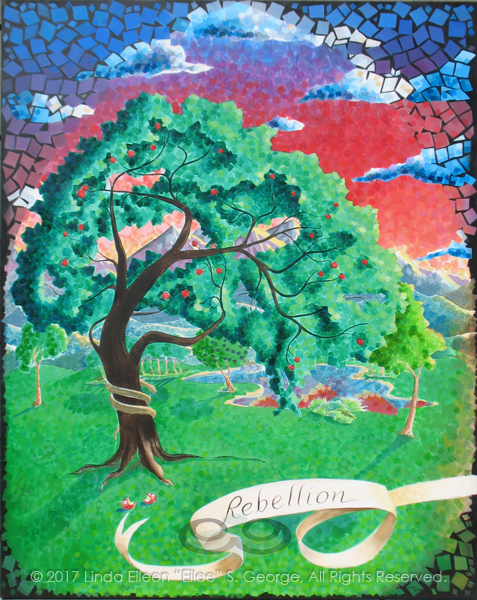 Digital photo of acrylic painting entitled “Rebellion: The Tree of Knowledge of Good and Evil” © 2017 (Linda) “Eilee” S. George, 48″w x 60″h, part of the “3 Trees” Triptych within the Israel Series for Calvary Community Baptist Church in Northglenn, CO; lovingly painted with squarish strokes in a Neo-Pixelist style in colors including ochre, cream, mauve, plum, red, salmon, yellow, purple, blue, olive, charcoal, black, green, lime, violet, fuschia, indigo, sepia, gold, brown and white, depicting the Tree of the Knowledge of Good and Evil in the Garden of Eden, a serpent wrapped around its trunk and two bitten and hastily discarded pieces of fruit at its roots; signed L. Eilee George with logo – Eilee George of eileegeorge.com exhibits unique concepts and images of her own creation – this is a copyrighted image (and painting/detail) © 2017 L. Eilee S. George, All Rights Reserved. Not to be used in whole or in part or any derivative thereof, without strict written permission by L. Eilee S. George.